And the furious actions of community defenders aren’t limited to the English speaking world, as this story from the Philippines attests. This time it’s not high-powered rifles being used in fits of frustration and anger, but some well-placed explosives being used to knock-out the lines transmitting power from the objects of local fury. MANILA, Philippines — The Pagudpud Wind Farm of North Luzon Renewables (NLR) was disconnected from the Luzon Grid on Thursday night, February 18, after two of its transmission towers were bombed. 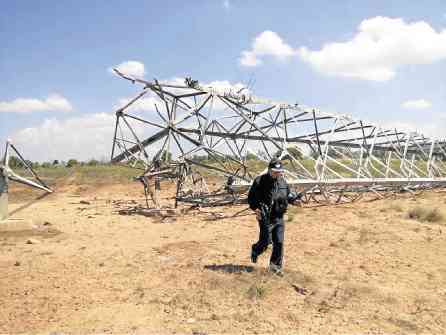 According to North Luzon Renewable Energy Corporation president Miguel De Jesus, it was only determined during early morning of Friday, February 19, that two of its transmission towers in Barangay Tadao in the Municipality of Pasuquin, Ilocos Norte, had toppled. “Initial investigations indicate that explosives were used to take down the transmission towers. No one has claimed responsibility at this time,” NLR said in a statement. NLR added that there were no fatalities or injuries related to the incident. The 81-megawatt wind farm is a joint venture of Ayala Corporation’s AC Energy Holdings Incorporated, Philippine Investment Alliance for Infrastructure, and UPC Renewables. 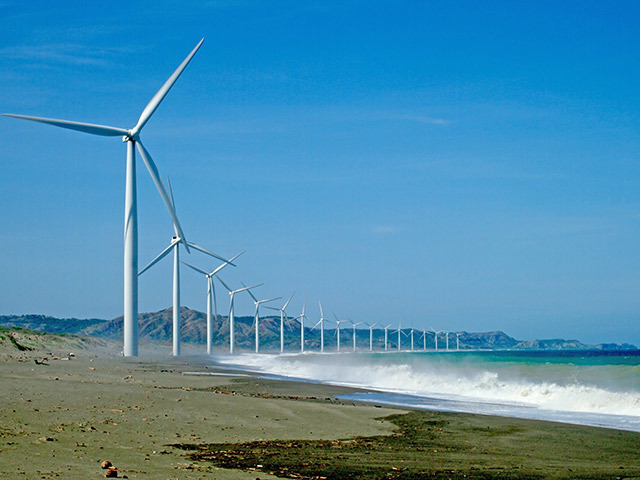 An Inquirer report said residents protested the launch of the wind farm last November 2014. They also appealed to the operator NLR to relocate its transmission lines, as these are passing through their properties, the news report added. NLR will continue to work with local and national law enforcement agencies, as well as the local government, to continue investigating this incident. 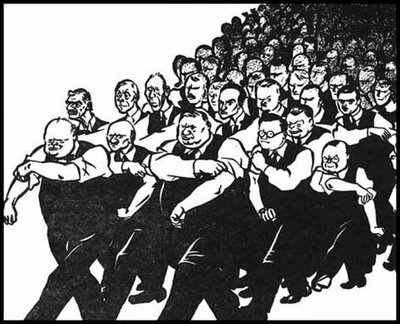 The wind industry: infuriating locals, the world over…. The people do rise up against oppressors, what this industry and its supporters are experiencing is reaction to people’s wishes and concerns being sidelined. Its an expression of how people will find a way to express their disgust and desperation at loosing control of their lives, property, environment and sense of well being. When Governments forget they are there to serve all the people and not their own and their friends ambitions and ideologies is when they will start to feel the anger if those they treat with disdain, those they see as being in the way of their goals, those who they see as unimportant, those they reject as having a human right to live their lives free from danger. This expression will be felt not only in the fields where the object of peoples desperation stand, but at the ballot boxes and in the streets, outside Government offices and in court rooms, anywhere those suffering despair can be seen and heard – they will ensure those who have profited by and/or allowed the visual, felt, sensed and heard torture to be imposed on them their families and the natural environment will know they exist. Those who worship this industry will know the sufferers feelings and that they will do everything in their power to ensure the media accept their responsibility to report the truth of the despair. They will ensure Scientists and Academic researchers accept their responsibility to undertake their work without bias- no matter who is funding the research – to ensure the destruction of lives and the environment is not covered up and expose the harm being rort. Our properties, homes and health have been destroyed, we have protested to and asked for assistance from every Office, to the highest levels; we have protested on the steps of Parliament, we have objected through our submissions, letters and emails, to current regulations and policies which allows and supports this harm to rural communities; yet turbines are rampantly being constructed too close to people and in inappropriate places. Permit conditions remain un-adhered to and turbines are operated and I dare say it, illegally. This is what happens, when gov’ts and industry fail to understand, that No means NO! !